1And I saw another mighty angel come down from heaven, clothed with a cloud: and a rainbow was upon his head, and his face was as it were the sun, and his feet as pillars of fire: 2And he had in his hand a little book open: and he set his right foot upon the sea, and his left foot on the earth, 3And cried with a loud voice, as when a lion roareth: and when he had cried, seven thunders uttered their voices. 4And when the seven thunders had uttered their voices, I was about to write: and I heard a voice from heaven saying unto me, Seal up those things which the seven thunders uttered, and write them not. 5And the angel which I saw stand upon the sea and upon the earth lifted up his hand to heaven, 6And sware by him that liveth for ever and ever, who created heaven, and the things that therein are, and the earth, and the things that therein are, and the sea, and the things which are therein, that there should be time no longer: 7But in the days of the voice of the seventh angel, when he shall begin to sound, the mystery of God should be finished, as he hath declared to his servants the prophets. 8And the voice which I heard from heaven spake unto me again, and said, Go and take the little book which is open in the hand of the angel which standeth upon the sea and upon the earth. 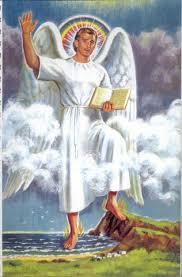 9And I went unto the angel, and said unto him, Give me the little book. And he said unto me, Take it, and eat it up; and it shall make thy belly bitter, but it shall be in thy mouth sweet as honey. 10And I took the little book out of the angel’s hand, and ate it up; and it was in my mouth sweet as honey: and as soon as I had eaten it, my belly was bitter. 11And he said unto me, Thou must prophesy again before many peoples, and nations, and tongues, and kings. This entry was posted in Discipleship and tagged 144 thousand, Angel, bible study, Book of revelation, bottomless pit, God, Gods chosen people, Gospel of John, Gospel of Luke, Gospel of Mark, Gospel of Matthew, Jesus Christ, Lamb of God, New Testament. Bookmark the permalink.